Energy is the capacity to do work and transfer heat. Work is performed when an object or substance is moved over some distance. Energy is needed to carry out processes, such as boiling water or burning candles. Energy is also the heat that flows from a hot object or substance to a cold one, when they come in contact. A clear example of this is the fact that water heats up when you put in a water boiler device. Energy has many forms, such as light, heat, electricity, chemical energy (stored in chemical bonds) and mechanical energy (moving matter, such as flowing water). All energy forms are divided up between two main kinds of energy. The first main kind of energy is kinetic energy, the energy of motion and action. Heat is a total of kinetic energy of atoms, ions or molecules. When these chemical compounds are in motion due to kinetic energy they will warm up. You cannot always detect heat that originates from kinetic energy, because sometimes the heat of a substance can rise without an additional rise in temperature. The second main kind of energy is potential energy, energy that is stored and potentially available for use. Before potential energy can be used it is transferred into kinetic energy. An example of an object containing merely potential energy is a dice that you hold in your hand. When you throw the dice the potential energy is transferred into kinetic energy and this will cause the movement. Water, like many substances, contains two kinds of energy. The first kind of energy is called kinetic energy. This is energy that is used during the execution of processes, such as movement. Because of kinetic energy water can flow and waves can exist. But water can also contain potential energy. This is energy that is stored in the water. Stored, but not used. This energy can become useful when water starts to flow. It will be transferred to kinetic energy and this will cause movement. Can energy be generated through water? When water flows or falls, energy can be generated. The generation of energy through water is usually carried out in large water power plants, with a number of process steps and the use of several devices, such as turbines and generators. The energy in water can be used to produce electricity. There are several benefits to the use of hydropower. Hydropower has a moderate to high amount of useful energy and fairly low operating and maintenance costs. Hydroelectric power plants emit very little heat-trapping carbon dioxide and other air pollutants during operation. They have live spans of two to ten times those of coal and nuclear plants. The dams that are used in the power plants help prevent flooding and supply a regulated flow of irrigation water to the areas below the dam. However, there are some drawbacks to the use of hydroelectric power. A hydroelectric power plant takes up a lot of space and this may cause animal habitats to go lost. Large-scale projects can threaten recreational activities and disrupt the flows of rivers. Due to the presence of dams and reservoirs, fish may not be able to swim to sea and aquatic life may decrease in the area of the hydroelectric power plant. How is energy generated in a hydroelectric power plant? The first step in the generation of energy in a hydropower plant is the collection of run-off of seasonal rain and snow in lakes, streams and rivers, during the hydrological cycle. The run-off flows to dams downstream. 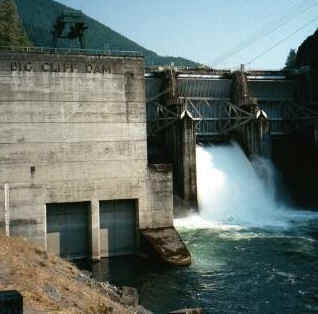 The water falls through a dam, into the hydropower plant and turns a large wheel called a turbine. The turbine converts the energy of falling water into mechanical energy to drive the generator. It turns a shaft, which rotates a number of magnets in the generator. When the magnets pass copper coils a magnetic field is created, which aids the production of electricity. Step-up transformers will than increase the voltage of the electricity, to levels needed for the journey to communities. After this process has taken place electricity is transferred to the communities through transmission lines and the water is released back into the lakes, streams or rivers. This is entirely not harmful, because no pollutants are added to the water while it flows through the hydropower plant. How much of the world's electricity is supplied by hydroelectric power? Hydroelectric power supplies about 20% of the world's electricity, and 6% of its total commercial energy. Production of electricity from waves and tides is an option today. About twice a day in high as well as low tides, water flows in and out of coasts and estuaries. This water can spin turbines, in order to produce electricity. But analysts have been taking a closer look at this form of energy supply and they believe that tidal power can only make a tiny contribution to the world's energy supply, because of the few suitable sites, the high construction costs and the risk of equipment destruction by saltwater corrosion. However, there are a few areas with the right conditions to produce tidal power. France and Canada own the largest tidal energy facilities right now. Is production of electricity from heat stored in water possible? Several countries believe that energy can be produced from ocean thermal gradients. They have been evaluating the use of the large thermal differences of tropical oceans for the production of energy. With the thermal heat in the water they want to produce steam that can spin turbines, for the production of electricity. The thermal energy in the oceans would be converted in conversion plants, which would be anchored to the bottom of the ocean. The technology of energy production from heat stored in water has not yet been applied, as it is still in the research phase. Analysts believe that this technology will not have enough economic value to compete with other energy production technologies. An alternative that may have economic value is the solar pond. By trapping sunlight in a freshwater pond the water will warm up, which causes steam production. This steam is trapped and used to spin turbines for electricity production. The principle is the same as electricity production from thermal energy in oceans, however, the technology is much simpler and it has moderate construction and operating costs.